Hi! 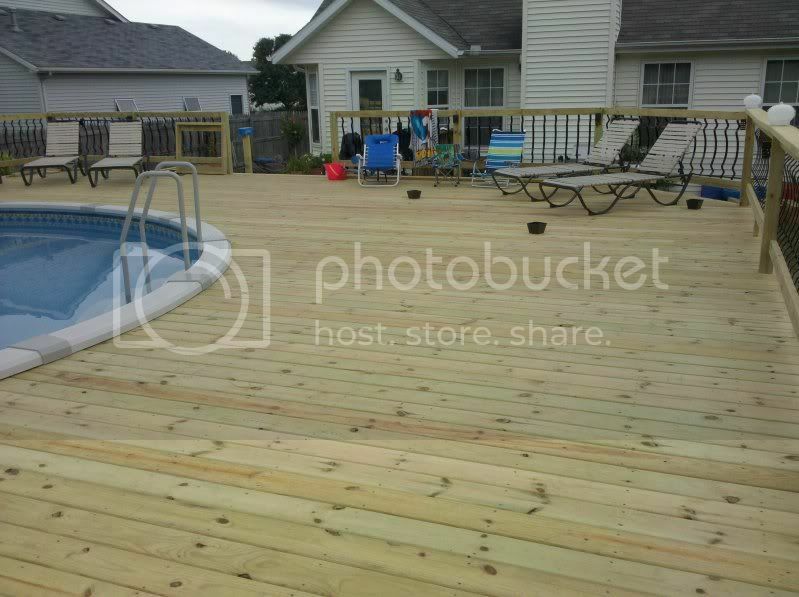 I just found this forum a few weeks ago and have read just about all of it now, I think (can we say obcessed with getting a pool?) We have a 6yo and 7yo and we want to enjoy the time we have together. The kids love to swim and we love the idea of them bringing their friends to our house instead of us sending them out somewhere all of the time. Gunite, fiberglass etc are probably going to have to be ruled our due to financial constraints. We got a ballpark figure from a couple of places. The vinyl liner pool people tols us around $23000-$25000 for a basic 18x36 setup. We talked to a Doughboy dealer who told us about $10,000 for a similarly sized pool. We would still need to build a deck at that price. We are planning to have them and others come out to the house and give us actual quotes, but I have a few questions in the meantime. Basically, I am wondering if anyone can elaborate on the pros and cons of one over the other. Thanks! I am looking forward to your responses! With an IG, you can have the depth for diving and your view remains unobstructed. Covering an IG is much easier, IMO, both winter and solar. Stairs and ladders are less complicated with IG pools. Downside is you'll have to have a code-compliant fence and removing the pool is a construction project in itself. AG is cheaper and faster. If you don't build a deck, climbing in and out can be awkward for some people, and if you do build a deck, you have access control issues similar to an IG. Typically, IG pools have better circulation due to multiple returns, but these can be added to AG pools. You have more options and flexibility with an IG pool, like slides, lights, spas, water features, automatic covers etc.. 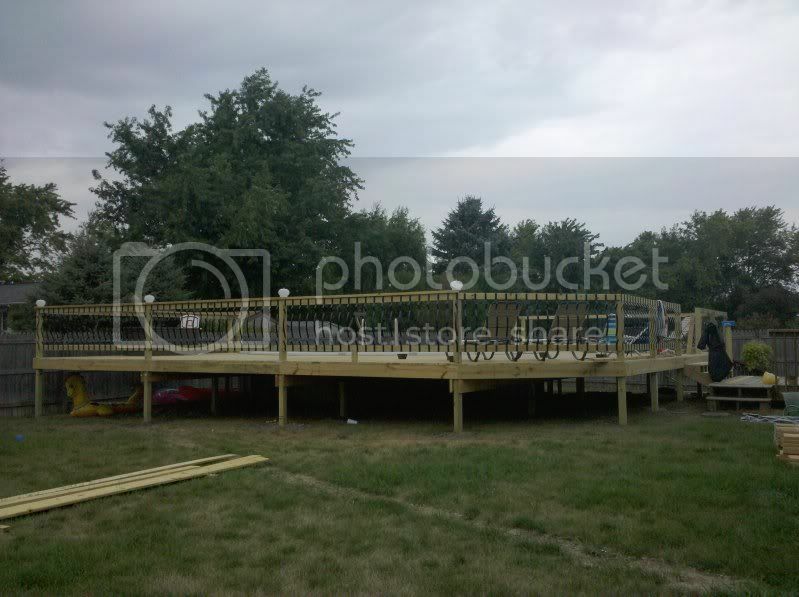 Without a deck, it's easier to watch kids in an IG than an AG. Vacuuming and generally cleaning is easier with an IG pool unless you have a full deck around an AG. I think where you live and how you live are 2 very important questions to consider when making this choice. For my family in Minnesota, as much as we love our pool, we can only use it 4 months of the year at best. So the greater expense involved in putting an in-ground pool in our yard just didn't seem to make sense. We are very happy with our 24' round AGP, and we didn't have to go broke to get it. By comparison, if we lived in an area of the country where we could swim year round (like Florida or Texas for example,) I think we would have chosen an in-ground pool and would have felt that extra money was well spent. Another question to ask yourself is can you see you and your spouse continuing to use and maintain the pool after your children have grown up and moved out? If not, then the AGP might be the winner as it can be taken down and discarded rather easily. Whatever pool you choose, I know you will enjoy it! We have about 15K in this setup. 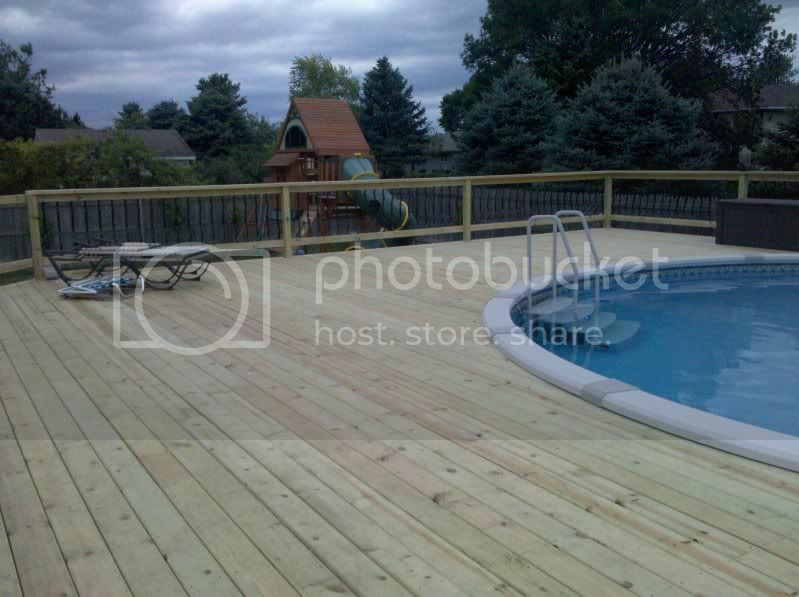 The deck is over 800 square feet around the pool so plenty of room for parties and friends. The pool is a 24' with 54" sides. My neighbor has a smaller fiberglass in ground and his cost was 39K including his patio. To me it was a no brainer on price for us to go with the AG over in ground. We already had a fenced in back yard so that cut down on some costs also. Very nice. Question for you.... With the decking right under the rim how do you cinch the cover? Thanks, I am going to use bungee cords or hooks on the deck. I can lift the rail up and get bungee cords down there to hold the top down no problem. Thanks for the great replies everyone! We live in GA, so we are hoping to use the pool from mid-April to mid-Sept. I can't wait to get some estimates. I don't think I mentioned we are moving, so we will be closing soon and can't get the estimates until after that. Thanks for showing the pictures! You have a beautiful setup! If you opt for in ground vinyl, I suggesting making sure you buy a premium grade vinyl liner, they can last a lot longer than the cheaper standard grade ones..